It is the customer’s responsibility to select the right truck for the topper. Selecting the right combination of topper and truck requires understanding a few guidelines. The truck bed is mounted to the frame of the truck with mounts that allow for some movement. It is important to allow enough clearance between your truck and topper to prevent damage due to normal racking, twisting and bouncing during driving conditions. The cab-over topper model should never be closer than 1 1/2″ to the tallest point of the cab of the truck. This could be cab marker lights or tracking system antennas, if installed. Also, ensure that there several inches of clearance between the truck bed side rails and the topper side wings. Many truck models have a tapered bed, whereas the bed depth is different between the front and rear. This can make the topper look tilted (front higher than the rear) along the bed of the truck. It may be necessary to place a bed mat in the truck bed to raise the topper to gain the minimum clearance requirements. A Federal Certification Label is located on all trucks. It is usually located on the driver side door post. It lists the Gross Vehicle Weight Rating (GVWR), the maximum weight at which the vehicle may be operated. It also provides a Gross Axle Weight Rating (GAWR), the maximum weight allowed for each axle. The GAWR, divided by two, is the maximum axle rating for each end of an axle. Toppers are considered “truck payload.” New trucks have their payload capacity posted in the glove box or on a specification sheet supplied with the truck owner’s manual. Trucks that have many options and/or a 4-wheel drive option have less payload capacity. To calculate payload, the truck manufacturers assume all seat positions are filled with persons weighing 150 pounds each. One way to determine the actual payload available is to weigh the truck full of fuel and with the number of passengers you will normally be carrying and subtract that weight from the GVWR. 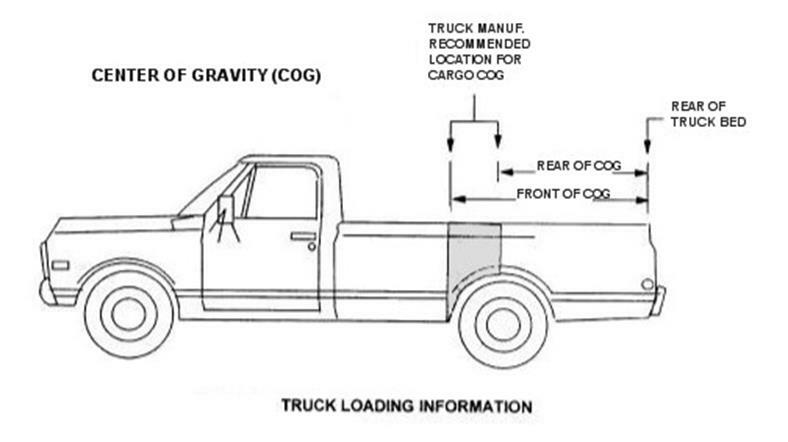 Truck manufacturers are also required to provide a “center of gravity zone” for topper loading. When matching a topper to a truck, it is very important that the center of gravity of the topper fall within the zone specified by the truck manufacturer. 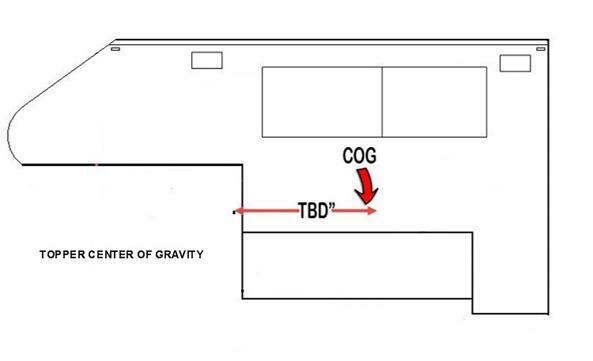 The figure below illustrates the location of the topper center of gravity within the center of gravity zone of a typical truck. This center of gravity zone is generally from the center of the rear axle to a point about 18″ forward thereof. The topper is labeled on both sides with the center of gravity location on the topper. (If no labels are present contact Kuntry Kustom RV to confirm COG) If the center of gravity of a truck topper is allowed to be behind the center of the rear axle, in other words, out of the truck’s center of gravity measurements, the truck may become light on the front end causing steering and handling problems, thereby jeopardizing the safety of the occupants while in transit.